A video of a brawl between a Pinay OFW and another foreign worker went viral, The Pinay OFW was pissed off because of the "pangbunganga" of the foreigner and her use of cellphone, Her fellow Pinays tried to stop them and they were also telling her to tell their madame about what the foreigner has been doing. 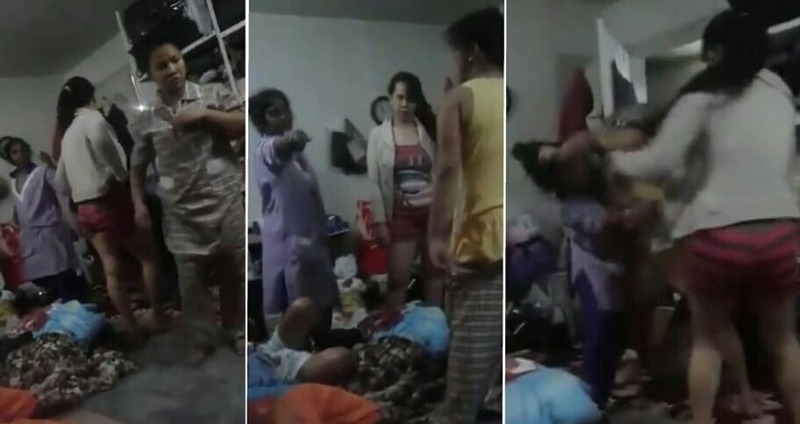 A video of a Pinay OFW getting into a brawl with another foreign worker while inside their cramped room went viral. We learned that there were several Pinays in the room with a foreign worker of unknown descent. Apparently, the cause of the altercation between one Pinay OFW and the foreigner was work-related. They were both shouting at each other with the Pinay cursing her using Tagalog, while the foreigner was likewise hitting back in her own tongue. At first, they were simply shouting, but then, they eventually grabbed each other and it erupted into a brawl. Iisipin kasi pinagtulungan mahirap magkaroon ng asunto sa ibang bansa tandaan nyo yan, Kung nasa Pilipinas kayo ok lang na gawin nyo yan kaya nyo mag paliwanag dahil Piipino kayo.